The Modern Acting and Theater course is a class that prepares its students to enter the world of theater. Its purpose is to show how students must prepare to enter into the theater community. The drama class reads a script together. The students taking this class all have a different approach. They have different expectations of what they will take away from this class. Tahoma junior Keith Ng explained that “this class made me sociable and confident,” based on the activities the class does. Some of the activities include practicing scripts, saying tongue twisters and becoming a new character. Tahoma junior Carlos Perez expressed his opinion that drama has united people “through personal art.” He explained that drama allows people to be different, and, with that difference, it brings people together based on the different opinions they have. Tahoma junior Florence Viado shared that the Modern Acting and Theater class not only teaches students to become more sociable, but also informs them that they could encounter obstacles in the theater community. Viado mentioned that the theater community is picky with certain races. She explained that “they don’t really pick minorities like the Asian community” and that she and her colleagues must work harder to achieve success. Ng, Perez and Viado all agree that the drama class brings people together in many ways, making them become a family. They also all agreed that the class helps them with their speaking skills. These students do not plan to pursue acting as a career; however, they are pleased with the ways that they have learned how to express themselves through drama. Ron Johnson, also known was Mr. Jay, has been performing in theater since he was 2-3 years old. Mr. Jay is the drama teacher at Summit Tahoma. He teaches his students about “what it means to be human” and the professional aspects of acting. The drama teacher explained that he wants to prepare his students for some obstacles he faced by “being a good community and being a good human being.” He believes that if enough people go out and learn what it means to be a decent human being, then issues of discrimination and racism won’t exist. Mr. Jay prepares his students for major obstacles in the theater community. He explains that the theater community is “a business of rejection.” He wants to prepare his students to keep going forward and moving toward their goal. 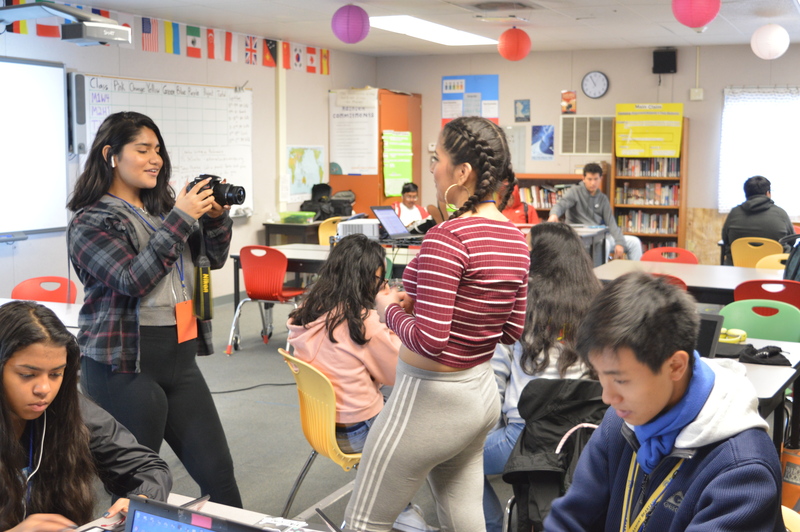 During Expeditions, the drama students were called over to the Video Production class and asked to perform a script (as shown above). They were then chosen to fulfill a role. This activity worked as practice for the drama students to show off their best qualities and to show the Video Production class why they would be the best candidate for the role. The Modern Acting and Theater teacher explained that the theater community is all about competition. He shared from experience that there are a lot of people trying to become an actor; however, he told his students to always stay true to themselves. That way, his students will remain relaxed and confident. However, acting means becoming a new person to fulfill the role they have been assigned. In the video, Mr. Jay explains that his students must remain neutral and focus on the character they are supposed to portray on set. Mr. Jay has many activities for the students to interact with each other. One of the activities requires students to complete a sentence all together using one word each. To prepare the students to become more vocal and confident, he has them do activities such as reading scripts and allowing his students to become a new character. This allows the students to explore new ways to express emotion or personalities. The drama teacher also introduces new ideas to make his students expand their acting skills. In the “Scooby-Doo Game” (shown above), six students take on a new character and look for clues that are given by the other classmates. Another activity he has his students do is a game called “Ping, Pong, Pang” (seen above). The students must line up in two rows facing each other and must go in order, saying either “Ping,” “Pang” or “Pong” while clapping and “serving” it to the person across from them. The game trains students to have a neutral stance and not too much focus on the word they will have to say. This activity allows the students to rely on themselves and feel the word they are supposed to say by instinct. Mr. Jay’s drama class shows off their personalities. Drama has brought people together for generations, and it continues to do so. Mr. Jay and his students have shown that with hard work and confidence, they are able to achieve success. The theater community always seems to bring hope and compassion. The actors are bonded with other cast members and crew. Students expect more close friendships and happiness as they continue their work in the theater community. 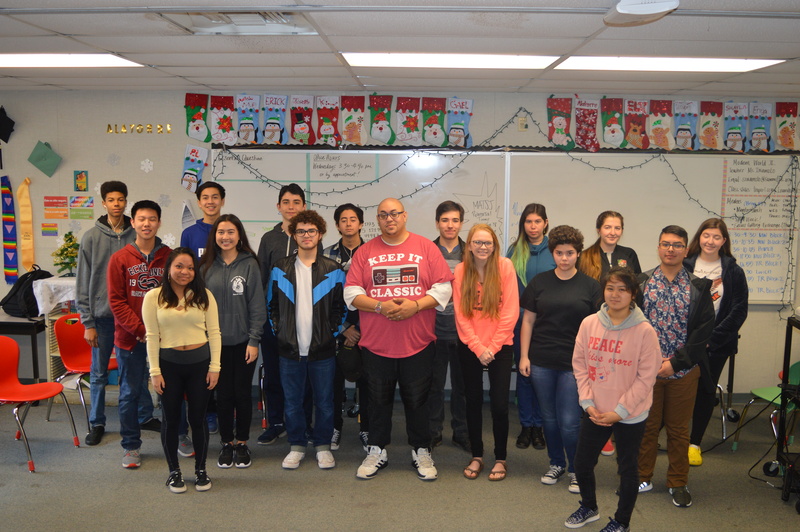 Featured Image (at the top of this post): Mr. Jay’s drama class poses for a picture.